Ben's birthday was last week and today we invited five of his buddies over for an ice cream social. Frankly, I was a bit worried about how to fill the time since it takes a kiddo 30 seconds to eat a slice of pizza and polish off a juice box. Coming up with January (indoor) party ideas was making me anxious. Eventually I decided that a treasure hunt was the best way to entertain the hordes. I spread the goodies out over all three floors; the most challenging part was coming up with the clues (and hoping that the kids could figure them out). We also decided to add in an ice cream sundae component to the party since our kitchen is still being rebuilt and I didn't have an oven to bake a cake. Ice cream is easy. When the kids arrived they were ushered over to the table where they decorated white goodie bags with their name and some pirate stickers. The evil pirate Captain Hook as STOLEN all the candy toppings for our ice cream sundaes. It is up to you guys to rescue the treasure. Can you help us?! 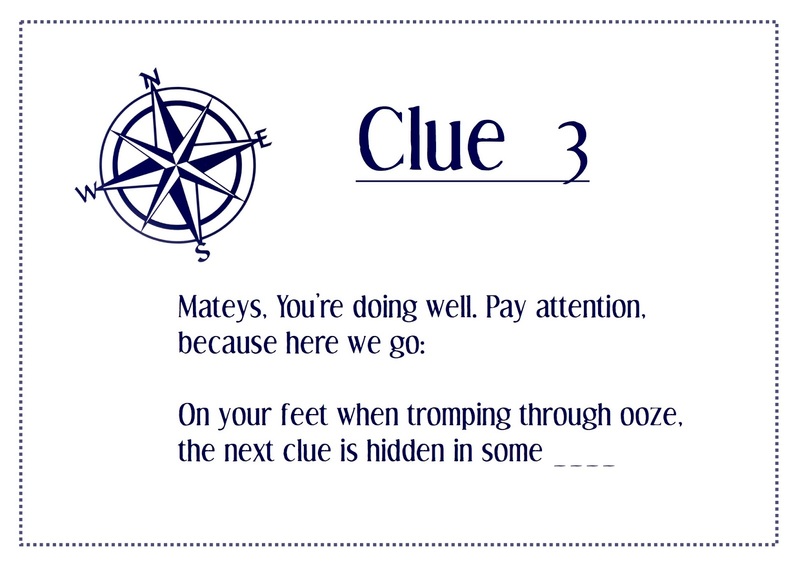 -There are CLUES (I held up the first envelope) with riddles, that you must solve that will tell you the location of the NEXT CLUE. -Along the way, you might find pieces of pirate treasure. There is ONE piece for every kid. -Once you find a clue, bring it to me and I'll read it out loud. -At the very end you'll find the buried treasure and only then can we have our ice cream sundaes. There were a lot of puzzled faces. Then Ben shouted out "BOBCAT!!!" Wtf? Oh dear, I thought, this is going to be a disaster. But I read it again, more slowly, and they guessed the right answer. That seemed to give them confidence and we moved onto the real deal. If they're not getting the clue, you can always read the whole thing (including the last word) and they'll still have fun hunting down the next clue. For the next clue we blew up a whole bunch of balloons and spread them out on the floor of our closet. Underneath were sprinkled gold chocolate coins. In amongst all the balloons, you might find some gold doubloons! 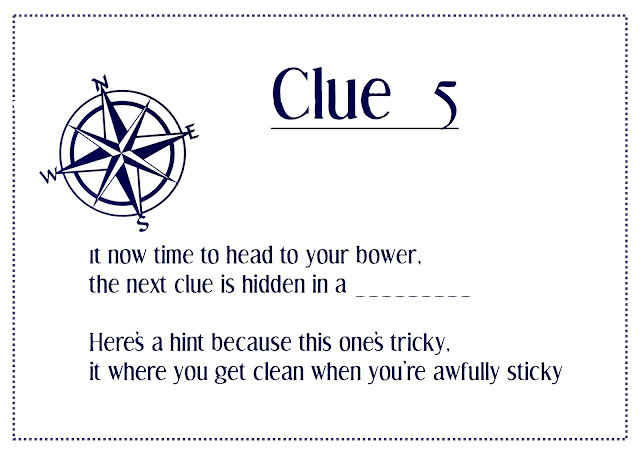 This is the last clue, you're almost there! Find the goodies and bring them back here! You are a clever brood! And now it's time to have some food! I should note that I came up with most, but not all of these clues. My Dears, the internet is a gold mine. Mix and match to suit your pleasure. where do we find our little emma? I thought it'd be cute to have Toddler Emma have the next clue in a backpack on her back but eventually decided that she might be overwhelmed by the sudden crush of big kids around her. What is that odorous perfume? Must be something in the baby's room! Make sure every kid gets to open (and then distribute) treasures to the other kids. They love having jobs at this age. The treasure doesn't have to be fancy. Our pirate treasure consisted of gold chocolate coins, cute little pens, glow sticks, and a toy car. Small stuff. Stickers, temporary tattoos, and packs of crayons would also work well. Frankly, you could probably nix the small stuff and just have the big pirate treasure at the end. Kids at this age can follow directions. I'd wait until goodies were stowed in bags before bringing the children back together for the next clue. The more attentive ones would shush the others so everyone could hear the clue being read. Don't be afraid to give hints. The joy is them running around the house in a big pack trying to find the next clue. Honestly though, somebody always got the clue. Five year-olds are bright. We spread our clues out strategically: one clue upstairs, then one in the basement, then another back upstairs. Gets 'em tired and hungry. The final treasure was a bag of candy toppings for the ice cream sundaes. We regrouped in the dining room and everybody was assigned a job: setting the table, pouring the candy into bowls, handing out juice boxes, and making sure there were enough chairs. Kids love having a job to perform. Then Chris arrived with pizza so we whisked the candy away before the kids could start gobbling that and instead put down pizza pie. Put the ice cream bowl in front of them, then clearly instruct that they can have ONE spoonful of topping(s). If you're my kid, you'll take one spoonful of every. single. topping. But then take the candy bowls off the table. Otherwise they'll just keep grabbing goodies and it'll be a huge mess. Another fun idea that my sister-in-law mentioned: Fishing. The kind where the kid has a pole, throws the end over the edge of the deck, and someone puts a small treat on the hook. Next year, perhaps. 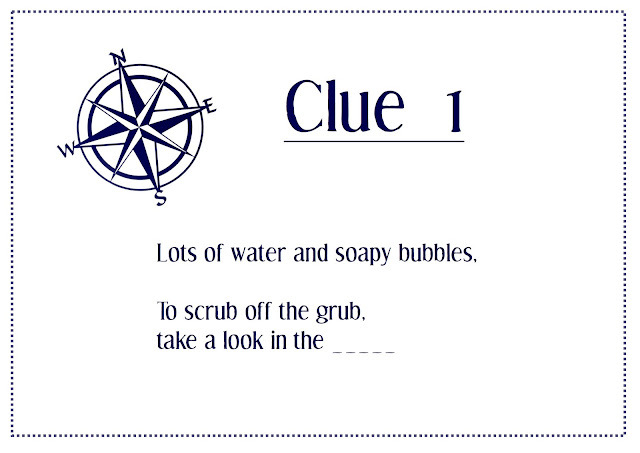 It's the most enjoyable and funny pirate treasure hunt! Thanks a lot for all details! Ben is a blessed child with such parents!